Pierre-Paul brings down Alex Smith for one of New York’s 6 sacks last week. Well there is one old adage that still serves: If you want to become a champion you have to beat the champion. The San Francisco 49ers had spent the better part of two weeks dispatching AFC East also-rans, in the Bills and Jets, to the tune of 79-3. Everyone anointed them the best in pro football yet forgot their next game was against the defending champion New York Giants. Now that the Niners have beaten Seattle and held 3 of their last 4 opponents to 10 points or less, you begin to understand how strong the Giants 26-3 win in Candlestick was. Not only did Eli Manning come through in another big win on the road, Ahmad Bradshaw ran with more thunder than usual (116 yards/1TD). The Giants defense was as forceful as it was opportunistic with 6 sacks and 3 interceptions. The pendulum has swung on expert ideas on who the best team in the NFL is. RG III eludes Viking defenders for 138 yards and 2 touchdowns in last week’s 38-26 win. How can you not be impressed by the Redskins RGIII?? Most young quarterbacks rely on their running or scrambling ability as they get their understanding of the pro passing game down. Now most of these runs are of the 7-10 yard variety that are a nuisance to defensive co-ordinators, but what do you do when a QB can break a 76 yard TD gamebreaker?? Especially in the fourth quarter on a defense that has tired from chasing him all day. It happened to the Minnesota Vikings last week. When asked before the season who would be better between RG III and Andrew Luck, it was this facet of his game that our CEO thought gave him the edge. 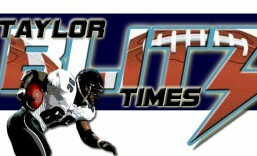 Do you realize that in 6 games he has 379 yard rushing and 6 TDs. That projects to his becoming the second quarterback in history to rush for 1,000 yards (1,010) yards, and would break Cam Newton’s rushing touchdown record of 14 touchdowns with 16. All of this before we remind you he’s completing 70.2% of his passes for 1,343 yards and 5 TDs. What makes RGIII’s season more remarkable is everyone thought the Redskins defense would be stout enough to allow him to make mistakes and ease into his role. No one expected a 27th ranked defense giving up 417 yards per game. We know the loss of Brian Orakpo was big, but Washington’s offense has to perform at a high level to bail out their defense. This week they travel to New York to battle the Giants. The Redskins are a personal foul call away from being 3-0 on the road however this will be different than trips to New Orleans, St Louis, or Tampa. This front four can tee off with the most athletic defensive line in the NFL. Where everyone thinks the key is to stop RGIII first, is the wrong approach. Osi Yumeniora, Jason Pierre-Paul and that front need to stop RB Alfred Morris (538 yards / 5 TDs) first. Once they are one dimensional or forced into passing situations, look for delayed blitzes and combination coverages keeping the safeties in tight. They’ll need to be there when Griffin III can’t find his receivers and looks to run. Couple that with the crowd noise and you’ll understand why we take the Giants in this one. Michael Vick’s 8TDs and 8ints. 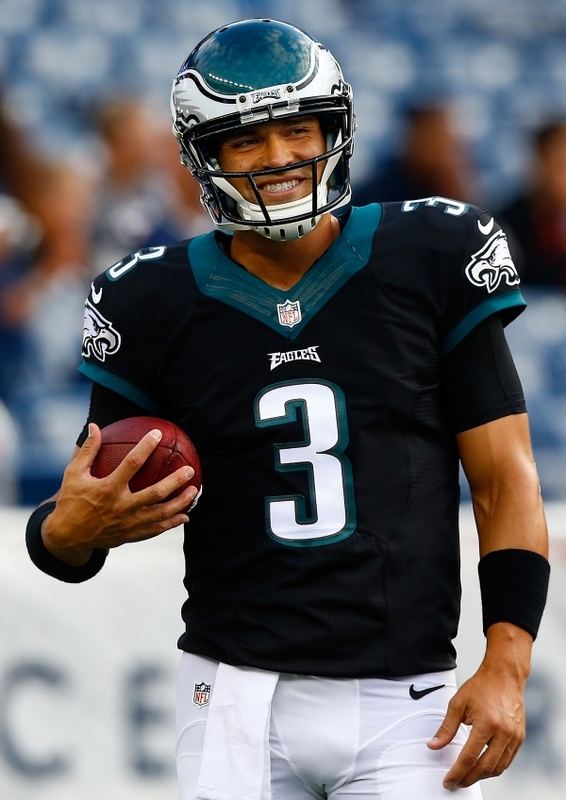 coincide with the Eagles record of 11-11 with him as a starter. Can he turn it around?? As for the tight-rope walking Philadelphia Eagles… can you believe the Eagles are thinking of benching Michael Vick?? They also fired their defensive co-ordinator and promoted Todd Bowles. Listen, when you see teams making moves like this, it’s a sign of desperation. The Eagles have lost 3 of 4 and two of those came against losing teams in the Steelers and Lions. So they are a bad 3-3. We hate to say it but you’re looking at the end of the Andy Reid era in Philadelphia. After the public comment by owner Jeffery Lurie ”That a year without making the playoffs is unacceptable” pressure is mounting by the week. One thing they can do is get the ball into LeSean McCoy’s hands more. With 111 carries for 459 yards and 1 touchdowns, he’s getting 18 carries per game but they need to push the limit of what he can take. Sure they risk burning him out but if it comes down to he and a more stationary quarterback, defenses will focus totally on him and limit his effectiveness completely. The Eagles are caught in an ugly vice and it’s all on Vick to save his and Andy Reid’s jobs. Horrible time for a bye week…& the clock is ticking. Speaking of coaches who’s job is on the line…keep your radar locked in on Cowboys coach Jason Garrett. Dallas is 1-2 on the road after giving away a game to the Ravens last week, but now they play 4 of their next 5 on the road. Uh oh!! Considering that they were 2-6 on the road last year with the same cast of characters, tells us this losing will continue. Garrett is in deep, deep, trouble. Time is running out on this era of inconsistent Cowboys football. We here at Taylor Blitz Times are always saying “At some point, you have to believe what you are seeing.” This is an average ball club with average personnel and very average results. 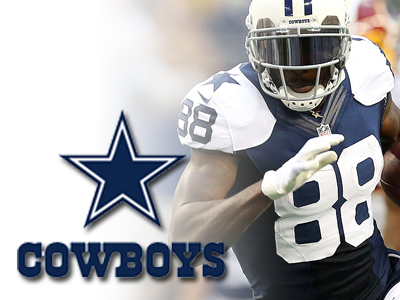 In their last 200 games, the Cowboys are 100-100. They are a mistake prone bunch that will give games away like they did last Sunday. Constant mistakes at the point where they’re concentration should be at their best says something about the damaged psyche of this football team. Can they straighten themselves out before this season is over as Jerry Jones would have you think?? The Chancellor just left our meeting shaking his head. Well the NFL has turned on it’s axis. Gone is the smashmouth reputation of the NFC East as 3 of the 4 teams will take to the air like never before. Only the earthbound Washington Redskins are going to root it out the hard way. 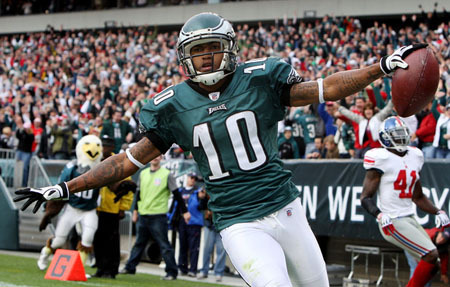 Dynamic playmakers in space will be the norm as the Eagles with the receiving trio of Desean Jackson, Jeremy Maclin, and Jason Avant will open up playbooks all over the division to keep pace. One of the real reasons for this paradigm shift can be attributed to Michael Vick becoming the Eagles starter, and the Cowboys drafting of talented WR Dez Bryant to team with Pro Bowlers Jason Witten and Miles Austin. The Cowboys have a fleet of 3rd down back types in Tashard Choice, draft pick DeMarco Murray, and Felix Jones. That tells you Coach Garrett and Tony Romo will have the artificial sky at Jerry World filled with footballs. To keep pace in this space race, the Giants last year drafted super talented wideout Hakeem Nicks to team with and Mario Manningham, to have their own fleet of playmakers. Ironically it was the Giants who forsaw the change in the division playing style first. Last year they made the move to increase their ability to cover 3 receivers by bringing in former cornerback and current free safety Antrel Rolle (The U) formerly of the Cardinals. This allows the Giants to mix up their nickel coverages with 3rd CB Aaron Ross. They had growing pains last year yet figure to be more solid in the secondary this year. The Eagles copied this formula by winning the arms race for CB Namedi Asoumgha and acquiring CB Dominique Rodgers-Cromartie to team with All Pro CB Asante Samuel. To win in the NFL in 2011 you must be proficient against 3 receiver sets. The Packers won it last year with their 3 good corners and this is trending across the National Football Conference. If you can’t defend 3 receivers in the NFC East, you’re going to be dead in the water. So where is this leading?? So why didn’t we address the Washington Redskins yet?? In a division where every team is going to assault their own record books in passing, the Redskins come in with last year’s 31st ranked defense against the pass. You remember that memorable Monday Night last year when the Redskins secondary took a ride on the Michael Vick Experience, losing 59-28, right?? Well to further enhance our reputation that Mike Shanahan is in over his head he only drafted one DB!! That wasn’t until the 5th round. After fumbling with the Donvan McNabb situation, releasing Clinton Portis (The U) who was slowing down, the keys to the offense are handed over to QB John Beck. Who?? Exactly! He’ll be handing off to ….zzz… sorry we want to keep you awake for the rest of this article. This should be the swan song for Coach Shanahan as this team needs to get younger. During that type of transition a younger more dynamic coach is needed. One like John or Jim Harbaugh those players can relate to. The Redskins have been one of the most mismanaged organizations of the last decade and it’s embarrassing to watch. This once proud franchise whose games back in RFK that are so romantically revered, have to suffer through Daniel Snyder’s regime. We’re embarrassed for Redskins fans. Mike Shanahan?? One of history’s most overrated coaches whom the game has passed by. Now on our facebook page it’s been fun to listen to Dallas Cowboy fans decry that the Super team from Philadelphia hasn’t looked like it in the preseason. All of the NFL will struggle this year with rhythm and timing early. The offenses will struggle until they gain they’re sea legs around the 4th week and after that we will be in for a season of high scores as defenses, who haven’t totally conditioned this offseason, start to tire. As for Cowboy fans, there will be plenty of offense as Romo has to pass to keep the Cowboys in games and coming from behind with such a suspect defense. Romo is going to flirt with 5,000 yards this year. He’ll be forced to. Already he owns the all time Cowboys yardage mark for a season with 4,629 and the two highest touchdown totals with 36 & 29 respectively. Quit with the Troy Aikman comparisons already. He threw for over 20 TDs in a season just once. 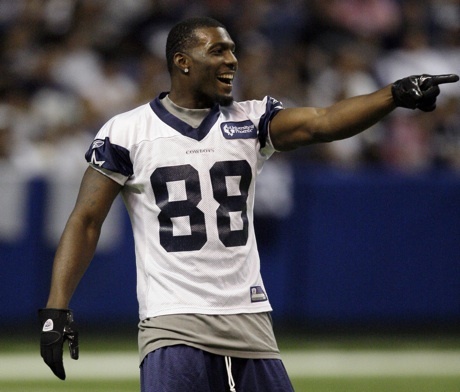 Romo needs to trust his new freak of a weapon in Dez Bryant. If he is one on one with a corner, chuck that ball deep and don’t settle for the 4 yard pass on 3rd and 17. What Romo needs is some daring. The Cowboys will come undone with the same formula as in 2010: inadequate pass rush, trouble stopping the run and a secondary that suffers from the lack of a rush. You can score so much but invariably you have to stop your opponent. 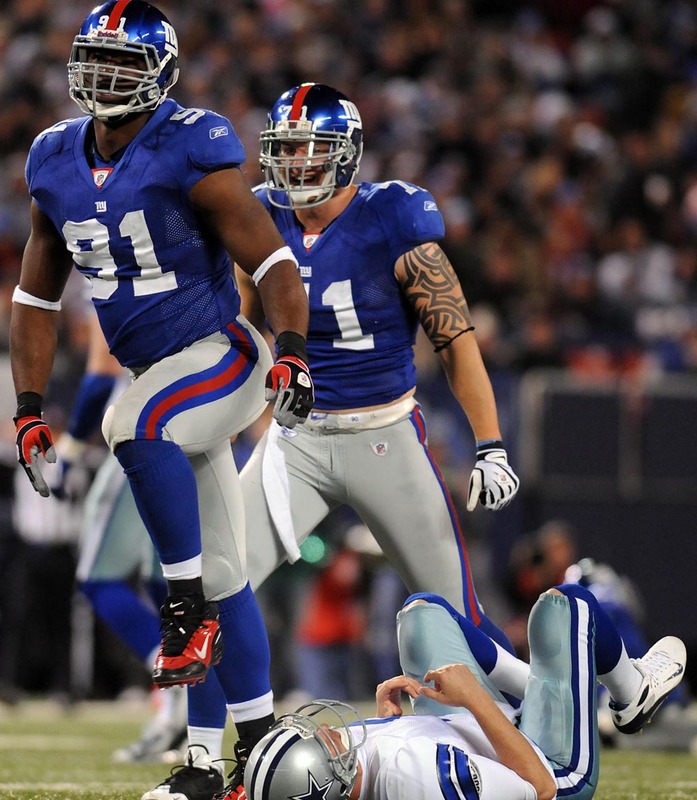 As for the New York “Football” Giants, they are the team with the total package right now. They can beat you running the football with Ahmad Bradshaw and a rejuvenated Brandon Jacobs or they can send a fleet of receivers into your secondary. They seemed to have smoothed things over getting Osi Umenyiora back to camp and should field a fierce rush. The question is can the secondary play as well as advertised?? The other question mark is the enigmatic Eli Manning who threw 25 interceptions last year. What is puzzling about his play is you can watch him quarterback on drives where he looks off the safety, then complete his footwork and deliver a 20 yard strike downfield. Then follow up with an interception where you’re shaking your head at home “Didn’t he see that linebacker sitting there?” He has to become more efficient with the football and not leave his defense out to dry so much. Yet it’s this “on again-off again” part of his character that will cost the Giants, and they will miss the playoffs again because of it. Let the comparisons begin for the Philadelphia Eagles. Are they going to be the ’94 49ers who signed a slew of free agents then went on to win Super Bowl XXIX?? Or the 1995 Miami Dolphins who picked up 8 free agents in an attempt to get Dan Marino his ring, only to fall short once the team didn’t gel and stumbled to a 9-7 finish?? We’ll say closer to the 49ers situation. It’s only a matter of time for this team to get open and scoring on offense. They brought in RB Ronnie Brown to aid LeSean McCoy in running between the tackles. They have WRs Sinorice Moss formerly of the Redskins and Steve Smith of the Giants to add further explosion if Macklin or Jackson get hurt. On defense, they pulled a coup when they signed Asoumgha. The fact they had Rodgers-Cromartie already in the fold from the Kevin Kolb trade was enough of a boost to the secondary. Now they can be special.